§ 576-419. Daily parking permits. A. Purpose. The daily parking permit is designed to make legal parking more convenient by having the motorist prepay the parking meter fee in return for a permit (sign). 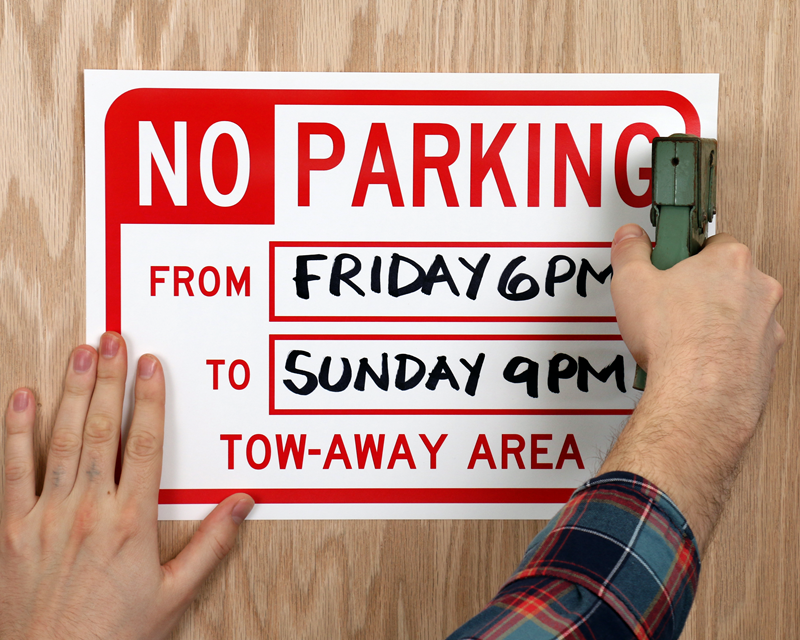 These signs are intended for short-term use only; they are not to be used in place of long term off- street parking. Daily parking permits are good at all metered and non-metered legal parking spaces. They do not permit parking in prohibited parking zones. (1) The Reading Parking Authority may require a separate Police Department-issued “special event” permit for issuance of four or more signs. (2) The daily parking permit shall contain the name of the individual or organization renting the sign and the date, time and location of use. (3) Signs used in parking meter areas must be posted prior to 5:00 p.m. on the night before its intended use and posted one sign per metered space. The permit must be attached to the meter pole with string or wire. The use of tape is not permitted. (4) Signs used in non-metered areas must be posted 12 to 16 hours prior to the time indicated on the signs. One sign is required for every parking space. (5) Daily parking permits are exempt from street cleaning. (6) Daily parking permits cannot be used at loading zones or pickup zones. (7) It is illegal to alter this sign or attempt to use it at a date and/or time other than originally specified. (8) After the sign has served its need and is no longer valid, the renter is responsible for its prompt removal and proper disposal. (9) Should this sign become damaged or worn out before you are finished with it, bring it to the Reading Parking Authority for a replacement. (10) No refunds or replacement signs will be issued by the Reading Parking Authority due to rescheduling of events, inclement weather or non use by the renter. (11) Any violation of any of the above regulations may result in prosecution. C. The cost of the daily parking permit shall be as provided in chapter 212, Fees. § 212-144. Vehicles and traffic.